We try really, really hard to waste as little food as possible. Soft or squishy tomatoes are perfect for homemade ketchup and brown bananas are excellent in Mr. Crumbs’ favorite muffins. Any other fresh produce that goes uneaten from snacks or meals is tossed into a container in the fridge, and at the end of the week, is added to whatever smoothie concoction we’re making at the time. Leftover plain oatmeal becomes any numerous flavors of baked oatmeal or a chocolate snack cake. Chocolate cake, if I get to choose. But what REALLY makes my day is when those last little bits of food can be turned into something else that I normally buy. Rinds from oranges, limes, lemons and even key limes are soaked in vinegar to make the easiest all-purpose (and all-natural) cleanser ever, and we haven’t bought a cleaning solution in well over a year. Naturally, apple dishes means lots of apple cores or peels. We were using them in smoothies… and adding them to our garden dirt (one of the easy and free ways to improve the dirt now, for next season)… but even at the rate we were going through apple dishes (both for testing, and enjoyment), I still had plenty on hand. 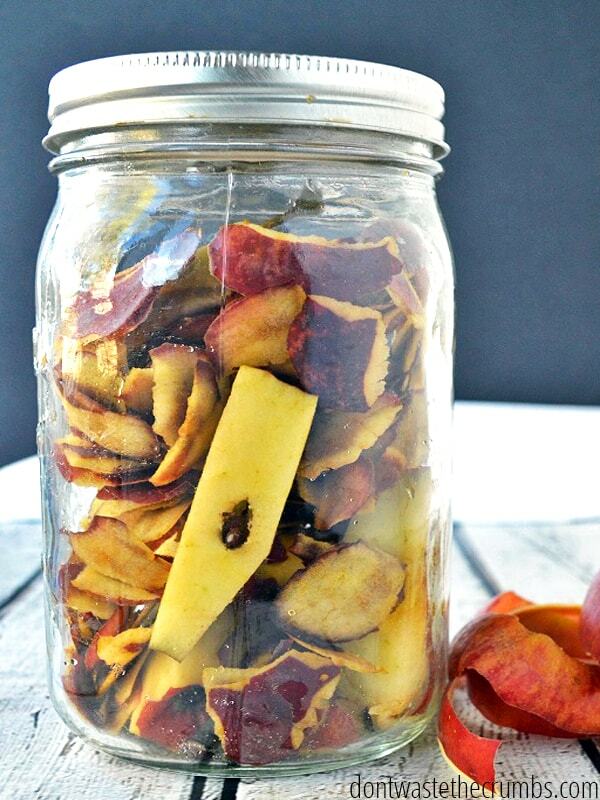 As it turns out, you can use apple peels and cores to make homemade apple cider vinegar! This, my friends, is truly an ingenious idea. We use apple cider vinegar for a variety of things… soaking grains, warding off cold bugs, as a facial toner and even to remove moles! Pasteurized apple cider vinegar is what most stores carry, and it’s fairly affordable. However, it’s always best to get the raw and unpasteurized version whenever you can. Unfortunately, the better option comes with a bigger price tag – $20+ for 64 oz of “raw and unfiltered” on Amazon. On average, it takes us a couple of months to go through a 32 oz glass jar of apple cider vinegar. Spending $5 each month isn’t so bad, but still. If I can make the same thing for FREE, then why not?! Note: You want the peels to be from apples that have been scrubbed very, very well. Organic apples are preferred, but simply buy the best you can afford and use this all-natural produce cleaner. Secondly, it’s okay to use brown or bruised apples. However, it is NOT okay to use moldy or rotten apples. 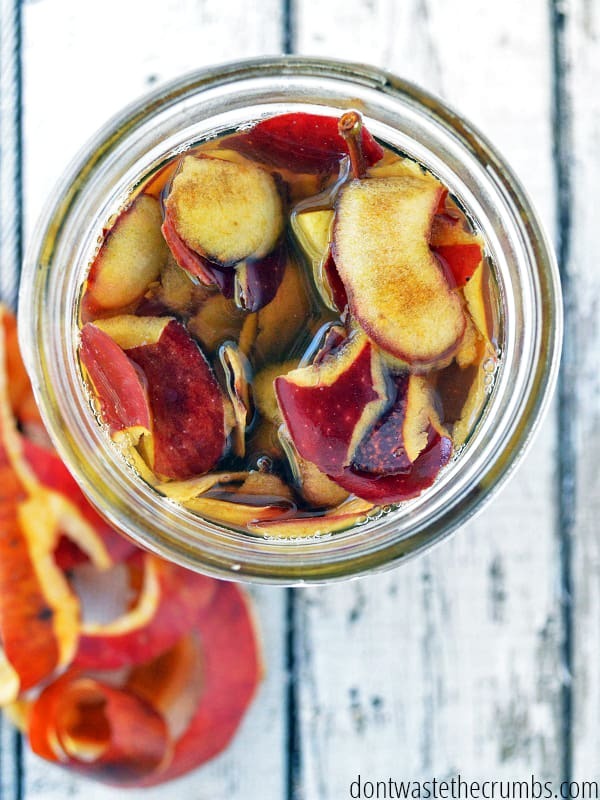 Place apple peels, cores and/or any browning or discolored flesh in a quart-sized glass jar, filling no more than 3/4 full. There needs to be enough room for the apples to expand after absorbing liquid, and room for the apples to be completely submerged. Tip: You don’t HAVE to use a quart-sized jar, but it’s what I readily have available. Feel free to use whatever size jar you have on hand. Add 2 Tbsp of sugar and 2 cups of filtered water to the jar so that the apples should be completely submerged in water. If they are not, you can add an additional 1/2 Tbsp of sugar and 1/2 cup of water. This is important, as mold can grow on any portions of apples that are not submerged and ruin your batch of vinegar. If necessary, you can add a lid of another jar with weights on top to keep the apples submerged. The sugar is used to help feed the fermentation and while optional, it helps to speed up the process. Stir the apples, sugar and water and cover with a coffee filter. Secure with a canning band, or a rubber band. Tip: If you’re using a different sized jar and adjusting the quantity of sugar and water, the ratio is 1 Tbsp sugar per 1 cup water. Allow apples to sit in a warm, dark place for 2 weeks. Above the refrigerator or on the top shelf of a cupboard are great places. Just don’t forget you put it there! After 2 weeks, you might notice some fizz or some bubbles. That’s good news! Strain out the apples and compost (or feed them to your dog or whatever… just don’t throw them away!). Cover the apple cider vinegar again with a coffee filter and canning band and allow to continue to sit. The vinegar may become cloudy or a SCOBY could form on the top, both of which are normal. Taste the vinegar once a week until it’s to your liking. You can stop the fermentation process by replacing the coffee filter with a canning lid and storing it in the refrigerator. And that’s it! You’ve just made your own apple cider vinegar and saved yourself some cash! Well, it’s hard to say that this recipe really costs anything at all, since you’re using what was going to be in the trash can in the first place. BUT, I did say you needed sugar… so, we’ll do the math anyway. As written, this recipe makes approximately 28 ounces of vinegar and costs just 1¢ per tablespoon of sugar. So one batch of homemade apple cider vinegar costs $0.02. The entire process can take anywhere from 2-6 weeks. If you would like to speed up the process, you can add 1 1/2 Tbsp raw, unpasteurized apple cider vinegar for every 2 cups of water, when you add the sugar. This would be called a starter, and helps to kick start the fermentation process. Strain the apples after just one week, and taste each week thereafter. You can substitute honey for the sugar, but since it’s eaten by the yeast anyway, I prefer to use a less expensive sweetener. You can also omit the sweetener altogether, but the total fermentation time will be up to six months. Can you use this apple cider vinegar to make more? Yes! What do I do if I have a SCOBY? I would use it to make more vinegar, but I’ve heard dogs really them as a treat. My vinegar is moldy. Is it still good? No, toss it out and try again. I’m usually willing to toe the “is it still okay?” line, but I draw the line at mold. 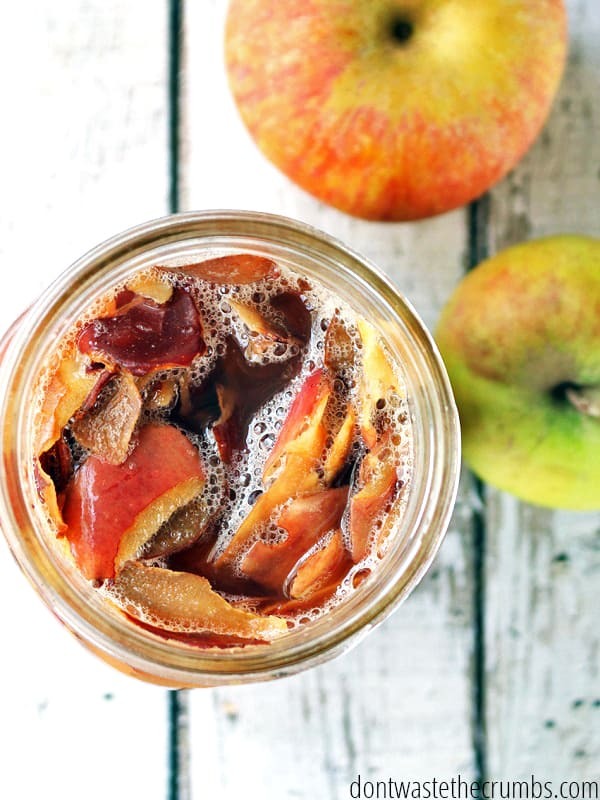 Looking for Apple Recipes Just to Make Apple Cider Vinegar? Find tons more Kitchen Hacks and Tutorials here. What about you? 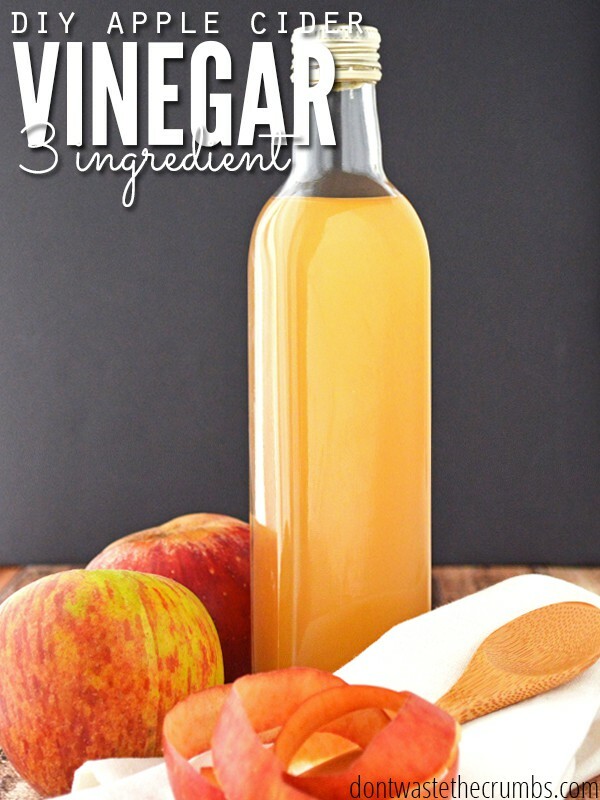 Have you ever made your own apple cider vinegar before? I’ve heard you can make it with other fruits too, like peaches or cherries! This looks so cool. I definitely need to try this, I just got gifted a box of honey crisp that are pretty beat up looking, this will be perfect for the trimmings. I just started making and drinking good girl moonshine with raw apple cider vinegar about two weeks ago, and for the first time in my life the rest of my family is sick and I’m not. I’m a total ACV convert now! Recipe I use for Good Girl Moonshine. 2 c. water 1 tbsp. vinegar 2 tbsp. lemon juice 2 1/2 tbsp. truvia or sweetener you prefer 8 drops liquid stevia 4 strawberries OR 8 drops strawberry flavoring 3/4″ hunk of fresh ginger root-I like to use garlic press to press out juice and discard root OR 3/4 tsp. ground ginger 8 drops of lemon extract. Can shake up in mason jar; or if using fresh ginger, use blender to blend up fibrous ginger root. (Fresh ginger is much tastier than powdered-just my opinion.) The recipe says to put this all in a quart jar and fill to the top with plain water. I prefer to add no extra water so as not to weaken too much. I just put everything in a pint jar and fill to brim with water. This is a good blood sugar balancer. Adapted from Trim Healthy Mama eating plan. Karen, do you add both truvia and stevia? Thanks! I do not like strawberries at all. Can I substitute anything else? Yasmin – close the lid airtight. A coffee filter is what we use to make coffee in the States. That would be a Trim Healthy Mamma recipe yes? This is actually not apple cider vinegar, which would need to be made from apple cider (pressed apple juice turned alcohol). This is apple scrap vinegar. No, experienced fermenters do not call this a cider vinegar, and actually we’re quite frustrated that so many bloggers are passing off weak scrap vinegar recipes as a cider vinegar. The small amount of sugar used in this recipe will yield an extremely low amount of acetic acid in the finished product, creating a “vinegar” that is not shelf stable and prone to spoilage. It should not be substituted in health, cosmetic, or cleaning applications that call for full-strength cider vinegar. You cannot soak apples in water with a little bit of sugar and call it cider. Cider is the pure juice of pressed apples with no water added. And that is actually a legal definition, in the US – “VINEGAR, CIDER VINEGAR, APPLE VINEGAR. The product made by the alcoholic and subsequent acetous fermentations of the juice of apples.” (Source: US FDA) Apple cider vinegar, being made from pure juice, is a good source of pectin and other nutrients, which is why it has long been touted as a health tonic. 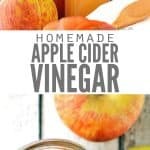 Apple-flavored light vinegar like yours does not have those benefits, and calling it a cider vinegar may confuse your readers into thinking they are making something at home which is comparable to a product like Bragg’s Raw ACV, which it absolutely is not. Wow! Thanks for this! I have started 2 batches of this recipe, and at the very least I know now to handle it a lot differently than I would actual ACV. Kinda makes me sad to know that now I have to start all over to make the actual product… But better that than noy understanding what I actually have made. Thanks again. Thanks for sharing this Sarah. Thanks to Sarah for the clarification on what true ACV is. I am just learning how to brew / ferment excess fruit from my orchard. I noted that the definition of wine disallows dilution. But I wasn’t sure whether the addition of sugar was allowed. I achieved enough sugar from some Granny Smiths mixed with some Winter Nellis pears to achieve an SG of 1.040 (> 5.5% alcohol by volume) to make what I believe should be a true cider. But all of my apples were covered with a lemon water solution to limit spoilage prior to freezing. The scraps were cleaned up and all of the lemon water solution placed with the scraps only achieving an SG of 1.012 or so. So I added Dextrose to target about 4.5% alcohol by volume. Just wondering if anyone knows whether the acidity could limit the formation of cider and the subsequent acetic acid. I was wondering if this vinegar is good enough for human use or just for cleaning? Thanks! Human all the way! 🙂 Hair rinse, allergies, daily health, soaking grains… go for it! 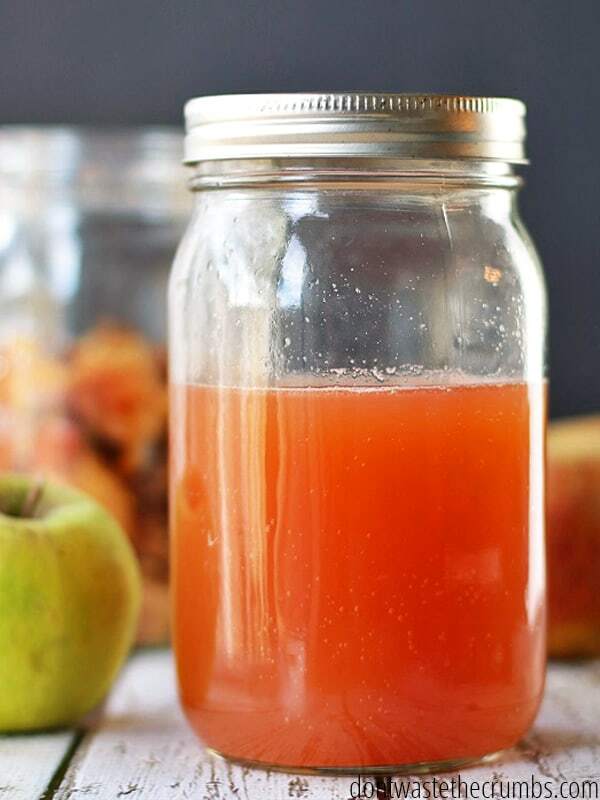 When this homemade version of apple cider vinegar is done ( 4 weeks of fermenting ) you will have the most delicious thing you ever tasted, as well as the most healthful. this stuff will correct your body pH to alkaline even though you think it should make you acidic. This is a truly blessed substance ever since Jesus was mocked on the cross and given it for His thirst while dying! Let me know how it goes Cathy! I bet it’ll be delicious! Can you imagine using it in salad dressing?! YUM! can I apple cider and vinegar to make apple cider vinegar? Hi Pamela! There are some words missing, but I think you’re asking if you can mix apple cider and vinegar to make apple cider vinegar? Yes, sort of. The ACV would be the starter, with the liquid being the cider. You would have to cover w/ventilation and allow the ferment to take place, but it should work… I’ve never tested this though, so cannot say with certainty, and if you try this, make sure your starter ACV has the mother, which would be vital to recreating the fermentation. I have a batch of this going right now. Plus a batch of peach and a batch of pear. It is so easy! You can use most any fruit. 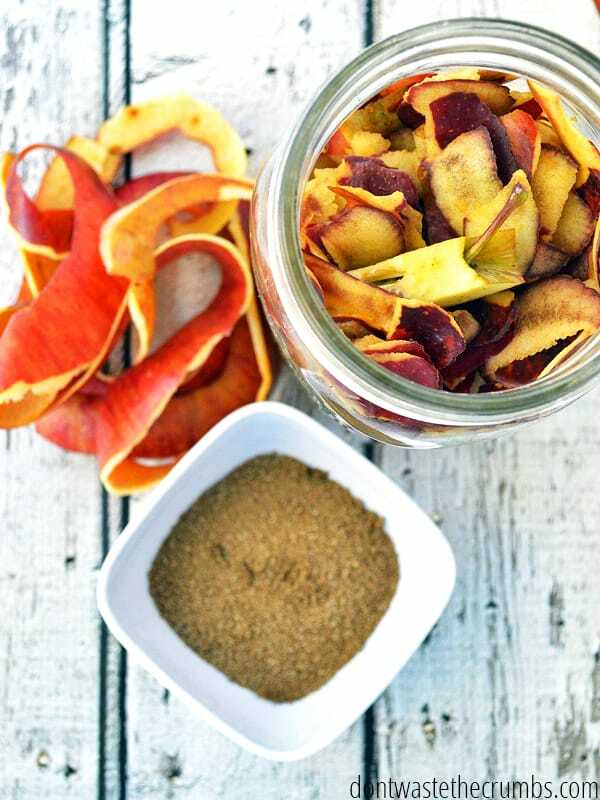 It is a great way to use up fruit scraps left over from canning or other cooking. Ooh, pear! I agree – great way to put scraps to good use! I tried a similar recipe using peels and cores, but it called for a much longer fermentation process with the peels (think it was two months). When I removed the peels, everything was slimy and ended up being tossed. I thought your recipe might be the path to success due to the shorter fermentation time. I’m dehydrating apples today so plan to give it a try. Just curious about the refrigeration. Hi Susan! I recommend refrigeration only to stop the fermentation. You can put a lid on it, and that will do it too, but just in case it keeps going (you know how ferments tend to have a mind of their own 😉 ), you can put it in the fridge. Geeze I just made 3 gallons of this, it’s not going to keep on a shelf? It will Amy, but there’s a chance it might continue to ferment slowly over time – just like with any raw vinegar. Strain the apples well and seal the container so that no air can get in and the fermentation process should essentially cease. Do you have to use the peels or would cores work just as well? We eat the peels in our house! Great outlook Tammy. You’re most welcome! THANKS!! I am sooo going to try this! I love ACV and our family of 6 uses it a lot. When we do applesauce in the very near future, I’ll make a large batch! How would this work for cleaning? I use white vinegar a lot for that and now you’ve got me wondering……. will it work in a plastic container, I have been cooking up applesauce and this time I decided to save all the peels and cores, but not being prepared, I don’t have any large enough, and am using a plastic pitcher…. is it important enough to run out and get a glass one? This was a question I was looking for, but in the end did run to a thrift store and found a 1 gallon glass “Sun Tea” jar. I’m sure it will work and be plenty big. I know plastic isn’t the best thing to use, but I still think the question might be good for someone else. Hi Pam! Sorry I couldn’t answer in time! Glass is best, but plastic will work in a pinch. Avoid metal though, as the vinegar will corrode the metal. 🙂 Those big sun tea jars are so versatile!! It should keep for quite awhile Susan. Since it’s naturally fermented, it has a much greater shelf life than the average foods. Vinegars can last from 6-12 months, depending. Always just by smell first, then taste. It will only get more acidic as time goes on, so if it’s “gone too far,” just be sure to dilute first. Hi Tiffany! Well I’m back a year later and making this year’s batch. After the fiasco of too many peels equals mold, I ended up with one qt. of good vinegar. I stored it in the fridge. I only use a T at a time mostly, so it lasted several months. Sometime the end of spring. beginning of summer I actually threw it away ( I know, I know, but there wasn’t much) because it was smelling like it had definitely gained an alcohol content, and no longer worked in my recipes. This year I’m starting the first batch (today!) using the sugar water, and all subsequent batches I will just use water, so thinking that will help space it out a little (processing a round 100 lbs again). I tried this and after two weeks there what I think was mold on top in each jar. I hadn’t check them recently and there were some peels above the water, I’m not sure if that was what did it. I make kombucha too and this didn’t look like what is on the top of my brew. Any thoughts? I tried this, after 2 weeks it didn’t look nearly dark enough, so I left it up another 10 days after opening it, with the apples bits in it. I opened it today and what I believe are fruit flies came out, the little eggs were attached to inside rim of jar but I see nothing in the ACV, is it still ok to use? a few flies fell in, but I plan to strain the apples pieces and all out. Also, what is a SCOBY? Hi Ginger! If there were fruit flies, I’d toss it just to be safe. SCOBY is the mushroom-like solids that are a natural byproduct of fermentation. It looks like a pancake, but it’s the catalyst for fermentation in kombucha. Thanks Tiffany! It smells alright, don’t have a SCOBY, just lots of thread-like strands and some scum. I’m not going to drink it diluted in water b-4 meals as I normally would but I am going to try it on a mole. I hate to waste anything. Will have to try again for drinkable ACV. I started a jar with some water, sugar, and peels a few days ago. Fun science experiment + free groceries = fun! Then, today, I found a jar of apple cider (the regular drinking kind, from a local orchard, so no preservatives) that accidentally got a little lost in the fridge. It is now somewhere between “hard” and “vinegar.” Can I add that to my other jar? Or is it better to just toss it? I think I know why to use the coffee filter instead of a lid – the plastic milk jug the cider was in was quite bloated! If you keep allowing it to torment, then freeze it you can make applejack, otherwise known as grain alcohol. I did it by accident one time. Keep going Susan. My liquid got thick too, but the color will darken with age. This year I am having the same thing with one of my batches of ACV, thick and slimy. Did yours ever turn out okay? I am thinking maybe to much sugar. I am going to cut up some more apples add some water and mix in this batch and see what happens. I’ve been fermenting my vinegar now for close to 3 months. I began with another recipe that called to submerge the apples for about one week I think? Anyways, I used spring water and just apple cores, and then strained and let it sit with a cheese cloth on top. They appear to have the SCOBY, but they smell awful- like stinky feet. They certainly don’t smell like the Bragg’s ACV I have. Do you think the ACV I made is still good? It’s a pretty revolting smell, and I’m not sure if it’s suitable for recipes. Hi Amber! I tend to go by the nose test, so if it smells revolting, I’d bypass for recipes. Mine never had a “bad” smell, but it definitely had an odor (typical yeasty/fermenty smell) that got stronger and “richer” so to speak with age. You don’t think it got contaminated or anything, do you? So, I started my jar two days ago. I’d suggest maybe adding to the instructions to use some kind of weight to keep the apples below the surface. I’ve already got lots of fizzy bubbles, but the apples had risen to well above the level of the liquid (actually even above the top of the jar) and were pressing the cover – fabric, since we don’t keep coffee filters – upward. There were mold spots on one core, which I removed, but I think I caught it quickly enough not to worry. I’ll be checking daily in case more mold spots emerge. Found a lid that just fit into the opening and set a few “pickle pebble” glass fermentation weights on top of it to hold the apples below the top of the liquid. I knew this wouldn’t produce actual apple cider vinegar, as another commenter suggested, but I’m hoping it will have similar enough properties to use in ACV’s place. If anybody has checked pH and compared the finished product to real ACV, I’d love to hear about it. I have some pH test strips and I’d be happy to test the pH for you this week. Great note on the weight idea, and I’ll be sure to add that into the notes above. Thanks for sharing your experience with the vinegar, and with controlling those runaway apples!! Bummer! I haven’t had any issues so far. I’m sorry your batches haven’t turned out 🙁 Any thoughts to the cause? I did not, but I haven’t heard of arsenic in apple seeds. I’ve only heard of seeds being a fairly good source of vitamin B12, and since we’re not digesting them anyway, didn’t think to remove them. Sir, you’d literally have to eat a coffee cup full of apple seeds to get an arsenic induced belly ache. My friend and I did over 100 lbs of apples this month, so we had a lot of jarsof ACV started. She kept 12 at her house, and I had 6 at mine. Our conclusion is that those made with just granny smith apples did not turn the dark reddish brown color after 3-4 weeks, but did smell right. 5 of my 6 had some form of mold, and yes, the apples were not covered completely. You might want to add to the recipe that filling the jar all the way full with the cores/ peels is to much. I think The Soup Fairy and I both believed in “more is better”, using too many pieces, therefore not having room for enough liquid to cover (or in his case expand over). Thank you for the suggestion Janice – I’m going to make that change right now. Thank you for leaving your experience and the great tip on the granny smith apples. I haven’t tried with any other variation (simply using what I had on hand), so it’s good to know that different varieties of apples produce different colors of vinegar. That would explain why a homemade brew would look different than store-bought! i’ve tried a mixture of both eating apples and cooking (bramley) apples, about 50/50 by weight. my question – how do i know when it’s time to remove the apple pieces and start the acetic acid ferment? Hi Nick! I pull the apples at 2 weeks, but you could go longer if you want. Some leave them for as long as 6 weeks, but I think it all depends on your environment. If you’ve got good smells and clear fermentation going, I say you’re good to go! I am very excited as I think my first batch of home made vinegar is almost ready! I added some Braggs ACV to mine as you suggested, to speed up the process. I strained the cores and peels after one week. It was so weak at first I thought maybe I strained it too soon. Each week I checked and it was still weak. I think I started this about a month ago or 3 weeks ago. I checked it tonight and it is starting to taste stronger and it is darker in color. I think I will let it go a little longer to see if it will get just a little stronger. It is a little weaker than Braggs, will it be anyway? The mother is settled on the bottom and I think a scoby is forming on top….it’s a white slimy thing floating around..but not a thick disk like I have heard it described. Is this the scoby and do I strain my vinegar or leave it as is to use? Do i plop that scoby thing into another batch of vinegar to make more? So, the 1st time, I got fruit flies (you may remember), the 2nd time I tried, the apples rose above the water and got moldy. Uggh. I almost didn’t try again, it was hurting my pride as my friends & family know me as a pretty good cook but I couldn’t make something I leave on a shelf for 2 weeks! FINALLY, on my 3rd try my ACV turned out. It’s much lighter in color than Braggs but smells right and tastes right. No more moldy apples b-c I figured out I needed to check it and add water during fermentation in these dry winter months, and found something small enough to put on top to hold the apples down under the water – a small round nail brush from a foot spa. No, this one was never used for that purpose. LOL! I’m glad it worked Ginger! I would have likely come close to giving up too, but what do you have to lose, right? The peels and such are only going in the trash anyway. 😉 Smart thinking to add water and improvise to keep the apples covered. My vinegar got slightly darker over time, but I think color might have to do with the type of apples used too. In either case, if it passes the smell & taste test – enjoy!! LOL, I guess it depends on your goal Marina. What do you think adding the cider will do to the vinegar? Anyway, i want to try this to use it con my beauty routine… So i want the best option. I’m trying my second batch of this, and have a question, please! The first batch got moldy and had to be tossed out. Pretty sure it happened because the apple peels and cores won’t stay totally submerged, rising to the top.. Any ideas? Hi Susan! You’re right on the first batch. To help keep the apples completely submerged, try a canning weight (if you have them), or a lid (or anything really, so long as it’s sterile) that’s just smaller than the opening of the jar and then something heavy on top to keep it submerged! Thanks for the suggestions 🙂 Seems fine, so far! I’ve got a question because I just made my first batch and while all the apple pieces WERE submerged, they eventually apparently got a bit above the water and developed some mold on the top of the pieces. I scooped those pieces out- but should I just scrap the whole thing or is it ok because just the top pieces had some on it? I probably already know the answer but had to ask lol. Yeah, you know the answer already. Luckily, the overhead on this is project should be nothing but time. Rookie here, some canning experience but not fermentation. If it is advised that I keep the fruit under the water level, how might I do that, I’m thinking there is an inherent risk of the fruit getting to or above the water level. Also, have you tried cores only, as opposed to cores and peels? I usually eat the peel and am wondering if there will be a process change if just use cores. Do you think you can freeze the apple cider vinegar? Come apple season I make a lot of butters and applesauce and there is no way I can go through that much vinegar, but I’d love to store it over the long term. Thanks! I did this last fall, turned out great, got a good food grade bucket, used heavy plates to weight it down, and covered with clean kitchen towels, secured tightly with string. Used all the peels trimmings etc. Then when I took the trimmings off I fed them to the cows and chickens. .I use it as a hair rinse (super hard well water) in food dishes, coleslaw dressing and put it in my chickens water dishes. I couldn’t get ever the amount of fruit flies this attracted. .
That was huge scale ACV making! I love the thought process behind that especially using glass plates to weigh it down. We have apple trees, and they produced well this year. I’ve been composting tons of scraps though, and I keep thinking about my one lone pickle jar of apple scraps that I’m trying to ferment. LOL! Hate to waste and don’t have room for a dozen canning jars on my cupboard shelf. I’ll have to give this a try. Thanks for sharing. I have a ton of apple scraps in my freezer and want to try this. Does anyone know if the finished product can be canned to store long term? I can’t fill up my fridge with (more! haha) quart jars! I’m reading some places that as long as you cap it once it’s done you can keep it on the shelf, but that does not sound right to me at all. Hi Charlie! Yes, and yes! cheers Tiffany. looking forward to trying it. I was going to buy some last week but its quite expensive! I used a wide mouth canning jar and a glass fruit jar lid to hold down the apples. Worked great! This is a great site…It has been just 3 days since I started with the acv process and Der is a white froth/bubbles in top.I just skim them to the side and stir d mix.Is it ok to keep on going or should I throw it?? White froth and bubbles is normal. Just let it go! my “apple cider vinager” has been fermenting now for almost a month. when i checked it today, its milky whitish and smells sour. should i keep going or just toss it. I started my two batches(that I condensed into one big gallon jar) back in late January. It’s been in my basement this whole time. Smells great. Nice amber color that I can see right through. Sediment at the bottom. I have yet to actually USE it for anything, or even taste it for that matter. But I know it’s going to be fine because of the smell alone. I’ll let you know how long it keeps once it goes bad. Thanks so much for testing this out Andrew! Hi I was wondering if anybody has used not only the cores and peelings but also chopped up apple flesh. It seems to me that the fruit itself might have enough sugar in it to be able to use less added sugar. Any thoughts on this? I have so many apples this year I can’t even give anymore of them away. Everybody had a great harvest. I guess if there is too much sugar it will just take a little longer to get used up. Thanks for this post and everybodies comments. I made ACV from peels September of 2013. I bottled it in 32 oz. juice jars and stored it in my basement with my canning jars. The vinegar is still OK. It was weak in color and flavor at the six weeks when it was bottled and the lids put on. After a few months the color darkened and the flavor became more vinegary. We use it for anything that we would use Bragg’s for. This fall we were again given lots of apples ——so I have a one week old batch going and just started my second batch. It is very important to cover the peels and to weigh them down so they stay under the liquid. I also put in some of my ACV from 2013 , not the mothers just the dark cloudy vinegar. As I finish the bottle of ACV –I pour the mother and the vinegar from the bottom of that bottle into another bottle to save them to use as starters for the new batches. Does using a coffee filter vs cheesecloth keep the fruit flies out? My mom is making a few jars, but covering with cheesecloth, and they all have fruit flies. I’m not sure if the covering makes the difference, but rather where you live and climate. I’d try keeping behind a pantry door to keep the flies out. The couple batches I’ve made I have used a coffee filter. No flies, and it let’s the stuff “breath” while it does it’s thing. I recently tried this and they got moldy 🙁 I was so sad I had to dump three beautiful jars of acv. I had plenty of water to cover the apples but they kept floating. Any tips on keeping them submerged? Hi, Jenn. I couldn’t find anything to keep mine submerged either, so I just checked on it everyday. I took a spoon and pressed everything down once a day for the first 2-3 weeks. It’s more of a pain, but for me it was better than having it go to waste. Hope that helps. I think it’s fair to say there is no “right” color. So many variables when you’re doing this in your own space. Light exposure, oxygenation (how well vented the top is) temperature to name a few. As long as it smells good, you’re probably fine. The batch in my basement is almost 10 months old. Smells and looks great, but I don’t think I’d be too worried about the color as long as the smell is right and there’s no mold. That said, go with your gut. If it doesn’t seem right, it’s not a huge investment you’re tossing. Great answer Andrew – thank you for chiming in! I am going to try your recipe for making a video. My question is, when you get the “mother” how do you use her to make more accurate? I am excited about making this. My daughter is making some now. Sorry, the above comment was suppose to say ” make acv” not a video. Crazy spell check. Lol. What I was trying to say is, what is the process of using the “mother” to make more acv? What should I do with my container of apple cores while I’m waiting to accumulate enough to start a batch, it could be a few weeks before we eat enough apples? Fridge? Thanks for the recipe. I was wondering if I could seal the jars? I just don’t want my house to stink up while I am making the vinegar… Or are there any tips to prevent the smell to cover the house while you are making this? Hi there! love the instructions.. I’m making fig,strawberry,white grapes and red grapes vinegar atm and they are all turning out really well.. i can see the scum on top and no mold BUT i covered the entire thing with unfiltered coconut vinegar and did not add water at all.. it’s going to be too strong.. can i add purified water at this stage? it’s only been a week now.. can i add water now? Hi there! love the instructions.. I’m making fig,strawberry,white grapes and red grapes vinegar atm and they are all turning out really well.. i can see the scum on top and no mold BUT i covered the entire thing with unfiltered coconut vinegar and did not add water at all.. it’s going to be too strong.. can i add purified water at this stage? it’s only been a week now.. can i add water now? or should i add it later after filtering the fruit after few weeks? HELP!!! I made this 2 times but wasn’t successful. I have it on my counter all covered up so it’s warm enough since it’s the change of the season, but it never gets real vinegary(is that a word)? It’s always weak. If it smells sweet, I’d just let it go longer. How long has it been Sue? On other recipes it says to leave the apples in the mixture until it has been turned to vinegar, is there a reason you strain them out beforehand? HI Tiffany. Did you ever get around to testing the Ph level out of interest? Hi Sophia – I didn’t. We ended up packing up and moving across the country and I haven’t started a new batch of vinegar yet! I’ve been working on my acv for probably 3 weeks. Right now it’s just a cloudy color and smells a little fermented. There isn’t any bubbling going on. Should I add more apples and keep it going? Or do I need to start over? How do you know when it’s time to take the apples out? Hi Kelsey! It sounds like it’s right on track! You can take the apples out now and if you want it to keep fermenting for a higher level of acidity, let it keep at room temperature. Otherwise cap it and call it done! Can I make this with apple cider, the natural kind, Not processed like juice? I haven’t tried that James, but you’re welcome to experiment! Hi Tiffany, I am trying to do the ACV as you described above. My mixture stands now for 3 days..is it normal that the liquid becomes like jelly? Thank you! Hi Peggy! The whole thing like jelly? I wouldn’t think so… but apple peel contains pectin, and that is used to make jelly. Natural cultures can also possibly form a scoby, although the chances are slim. I’m not sure what is going on, but if it smells ok, I’d keep going. Maybe you’ll just have to dilute once it’s done to thin? Ah, mine is also very very viscous, kind of like a sticky clear gel or slime. Still looks fine, smells great. A friend of mine thinks maybe pectin? I can’t really find any information about what to do — if you should just leave it, or if you need to add a brewer’s enzyme to break it down? Mine is not a total gel, just thicker, almost like a light syrup. I just strained mine and I have the same situation, more like a thick syrup. I don’t have an answer for you, just adding on here to see if someone else has had this result as well. Just a thought. I would think glass shot glasses, turned upside down, would work to keep the fruit submerged. ? If you aren’t opposed to using plastic, I’ve used a plastic zip top bag partly filled with water and zipped up to place on top of your jar of fruit or pickles or whatever you’re trying to ferment. Remove all the air out of the bag of water so it will conform to the inside of the jar. Push the bag of water directly down into the liquid to hold the fruit under the surface. This will keep the fruit submerged and since it doesn’t actually seal the jar, the gas from the fermenting process will escape around the edge of the bag of water. You may want to place your jar of apple scraps and water into a bowl to catch liquid that might run over the lip of the jar if you have it too full. This might work best with a larger jar such as the gallon size sun tea jar. Also a pint size canning jar filled with water and the lid screwed on should fit in most gallon size jars to hold the fruit down. Using the pint jar would work best if the gallon size jar is full enough of apple scraps so the pint jar sets above the rim of the gallon size jar so that you can get hold of the pint jar to pull it out. Just cover the whole thing with a cotton towel or cheesecloth and put a rubber band or string or whatever around the cloth to hold it onto the gallon jar. Thanks for the ideas Dan!! made two seperate jars at same time one is slimy the other not? ive read that slimy is ok and to keep going…what do you mean keep going? keep peels in or strain them it has been two weeks with peels. If it’s been two weeks with peels, go ahead and strain, but keep letting it ferment until it’s the desired acidity. I just want to say thanks again for this recipe. My first try didn’t work out because of mould. But my second worked wonderfully. I used it on salads and cooking but the most amazing thing was that I used it to cure my son’s planters wart in two weeks. Before this home made concoction, this beast was bad, let me tell you. I took him to the doc twice to try and have it removed with liquid nitrogen with no success. In fact after the first treatment the emperor struck back and spread to his other foot in spite of all my efforts to keep the wart covered. Cut the tip off a cotton swab and soak it in the homemade vinegar. Apply the soaked cotton tip directly to the wart. Cover the soaked cotton tip with duct tape trying to centre it on the wart. Leave it covered for two days. After asking my pharmacist nephew was really surprised by the results of this home remedy. He figures the acv may have changed the ph of the surface of the skin making it unfriendly to the beast. Mine developed a SCOBY on top. What should/can I do with it? Wonderful advice from all the comments. Thanks. I wish I read them BEFORE I tried this. I used a shot glass upside down… It was the only thing I could find small enough and I figured it was the most sterile. I noticed action after about a week. The filter was puffed up and completely soaked, dripping liquid down the sides of the jar and puddling at the bottom. There was lots of bubbling when I lifted and tilted the jar so I wiped it up, replaced the filter with a dry one and carried on. After another couple days, same thing, only this time I could actually smell the mould ( I’m super sensitive to smells). So, I threw it all out! But, I will definitely try again. This time, maybe not fill it so much with apples. I have one weird question. When you say apple cores, do you mean to include the ones that have been left after eating, or cut away? I’d think it would be ONLY cut away, but thought I’d ask anyways. Thanks for blogging. I’ve learned a lot. ? Glad the comments are helping you AnnieVee! As for the apple core, I would NOT use eaten cores for ACV, just cut. But eaten cores can go into smoothies for sure!! I don’t eat enough apples to have enough scraps. Could i just save the apple scraps by freezing them until i have enough to use? Thank you all for the interesting advice making acv. I used to make Kombicha years ago and enjoyed making it, I gave the extra ‘mother’ to our local health shop, they were most appreactve. April – does it smell bad? Or just sour? Sometimes “sour” is mistaken for vinegar, especially in home fermentation. If you don’t see any mold, then you’re probably fine. Hi, could you please enlighten me, what is a SCOBY. I have made the apple water part and it smells pleasantly sour. I am going to remove the apples now at day 16. At the edges where i couldnt completely submerge the apples, there is a skin that has formed that looked like a congealed scum that is a milky colour. I am assuming that i am to toss this out? Can i use the rest of the cloudy looking liquid and keep following your instructions? if i can skim off the milky skin on the side? Hi Michelle – that is technically an MOV – mother of vinegar! It is VERY similar to a scoby (Symbiotic Culture Of Bacteria and Yeast), but technically speaking, scoby’s are created in kombucha (fermented tea) while MOV’s are created in a vinegar solution. I have an MOV too, which I honestly haven’t done anything with yet, BUT I do plan to use it to make more ACV. You can do that, instead of using the mother from raw ACV when you make vinegar. If you don’t want to use it for awhile, store it in a jar w/some of the homemade vinegar – maybe 1/4 cup, depending on how thick it is. Cover w/thin cloth and secure w/rubber band. It’ll continue to thrive, but you won’t be forced to do anything with it right away. Congrats! It’s not a super common occurrence to grow an MOV, but it means making more ACV easily going forward!! I have tried this a few times now with different contraption involving jars and lids. But I still struggled to keep the apple scraps down and mold kept ruining my batches. This last time, I used a coffee filter pot and a piece of paper towel. I just cut a slit in the paper towel so it would slide in around the shaft. I was going to use a rubber band over the paper towel, but I thought I might brake the pot. So I just let. The lid hold the paper towel down. Perfect results and no mold! Wonderful – thanks for sharing Merrilee! Hi Chelsea! Discoloration is fairly normal, as it takes only a little oxygen to react w/the apples. You definitely don’t want mold, and you don’t want an off smell. As long as it smells good and the color is the only issue, I say you’re doing great! Im just wondering if anything can be made from apple peels after using to make vinegar. I used this recipe and it has been sitting for about 2 months. I had another batch of homemade act with the mother, so when I started this I added that mother in with the apple scraps. After a few weeks I strained the apples and the mother was all grown into the apple pieces. Now it looks great with more mother growing on top and it’s super cloudy, but very light in color, almost white. It smells right, but I havnt tasted. Do you think I should leave it a lot longer and hope the color gets darker? I was hoping to jar it in clear glass growlers soon. Any suggestions?? If it smells right, I’d judge by that over color (personally). Taste, and see if it needs more time, and get it bottled up! Hi! I also tried to make one at home my self! But the color of the vinegar was really cloudy and pale… did i do wrong? Hi is it ok to apply on my hair, Henna and make a Conditioner of it? cuz i really like everything home made and if i can use this vinegar for my hair it will be great, and can i make other blends of it? I’m not sure Julian, but if you try it and are successful let me know! Can I use brown sugar? Will the molasses be a problem? I don’t think I’d recommend brown sugar Sarah. In all the ferments I’ve seen, white sugar is nearly always used. SOS!I will move in there weeks and even if I start today it will not be read until then.Can I pause the procedure for one day and put the lid? I love making ACV. always have at least 1 gal going. I get used pickle jars from local places that sell the full pickles, like the Farmers Market. I’ve also made a pineapple vinegar that was delicious. Used the meat cut off inside of peelings. Never trust the pineapple peelings, unless you grow them yourself. Exact same process. 1/2 c of acv w/mother, pineapples bits, 1/2 c br sugar, (can also use honey, but takes longer), dist. water, & 2 Tbsp of lemon juice. Strain after 2 wks. Then after 2 more wks, start tasting & cap off, when you like the taste, then bottle. Another vinegar hack I love is citrus cleaning vinegar, (wht vinegar & citrus peelings). I clean everything w/vinegar. Peelings gives wonderful citrus smell. Having 2 Meyers lemon, a tangerine, a pink lemon, & a Ponderosa lemon. Citrus peelings in any size jar, (can keep in fridge for a wk, until you have enough), fill w/reg white vinegar, & cap. Put in dk cool place, remembering to shake at least every other day. After 1 mth, strain & keep in same jar, or put into spray bottle. I clean mirrors, tables, floors, etc w/it. So, I started and after the first two weeks with the scraps, my mixture turned very syrupy. Is this normal? I don’t recall mine being syrupy… how does it smell? It smells like vinegar. It’s just much thicker than the normal kind you’d get at the store. I wonder if it would help if I added more water? It might – let us know how it works out for you! Thanks for this post. For the many commenters who have ‘failed’ making the fermented apple scrap vinegar due to mold, I suggest they try using an airlock which will allow air to leave the jar, but keep the contents protected from molds, bacteria, dust and pests. They are not hard to make yourself, or there are companies selling them all ready to just screw onto your wide mouth Mason jars. A food safe bag filled with water and rested on top of the apple scraps will also cut down on molds, etc., but an airlock is the best in my experience. It’s also fun to watch how the water in the airlock responds to the pressure of the fermentation process in the jar. Using an airlock protects against contamination and allows the materials to create the ideal environment for fermentation. I use the Perfect Pickler, but you can also easily and inexpensivly make your own if you are a bit handy.